Night Fury dragon Toothless and Hiccup (Jay Baruchel) in DreamWorks Animation’s HOW TO TRAIN YOUR DRAGON, irected by Dean DeBlois. ©DreamWorks Animation LLC. Hiccup (Jay Baruchel) and his Night Fury dragon Toothless lead the Dragon Riders in DreamWorks Animation’s HOW TO TRAIN YOUR DRAGON: THE HIDDEN WORLD, directed by Dean DeBlois. ©DreamWorks Animation LLC. Hiccup (Jay Baruchel) and Astrid (America Ferrera) in DreamWorks Animation’s HOW TO TRAIN YOUR DRAGON: THE HIDDEN WORLD, directed by Dean DeBlois. ©DreamWorks Animatios LLC. 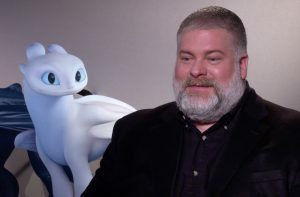 Night Fury Dragon Toothless and the female Light Fury dragon in DreamWorks Animation’s HOW TO TRAIN YOUR DRAGON, directed by Dean DeBlois. ©DreamWorks Animations LLC.